The bright sparks at the Electrical Safety Council (ESC) has come up with free phone apps to help landlords make rentals homes safer. The free phone apps take landlords on a tour of their properties with a room-by-room checklist of appliances, cables and sockets. Landlords can flag issues and the app offers some simple tips on keeping a home safe for tenants. The ESC argues misunderstandings over who is responsible for electrical safety can sometimes put tenants at risk. Official statistics show at least one person dies every day and 1,000 are injured as a result of poor electrical safety. One cause for concern is new landlords who are renting out their former home because they cannot sell. The ESC claims many of these landlords are unaware of housing law and do not call in an electrician to carry out a safety check. Buy to let homes do not have to have an electrical safety certificate, but common practice by letting agents means most landlords undertake the job. Shared houses in multiple occupation need a safety certificate by law. A qualified electrician must inspect the house and issue the safety certificate. “Most electrical accidents can be prevented by a Residual Current Device (RCD), a life-saving device which prevents you from getting a fatal electric shock if you touch something live, such as a bare wire,” said an ESC spokesman. 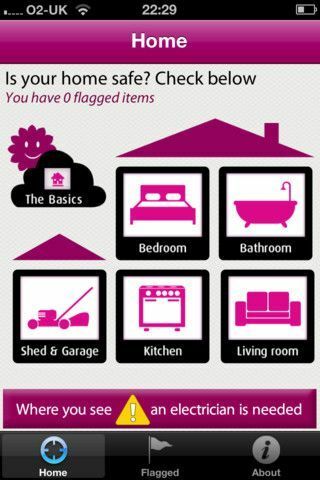 This entry was posted in Property Maintenance and tagged Electric safety, phone apps by Simon Thompson. Bookmark the permalink.